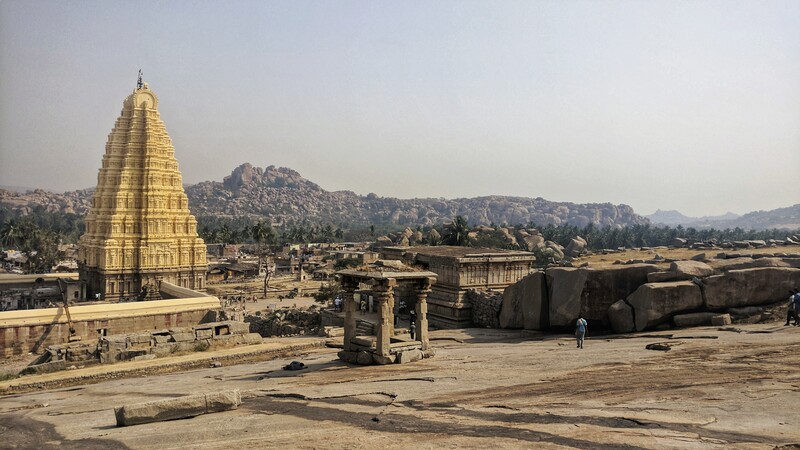 Hampi is a small rural village in the south Indian state of Karnataka. Truth be told there’s not much happening in the village itself, but that’s not what you come to see. 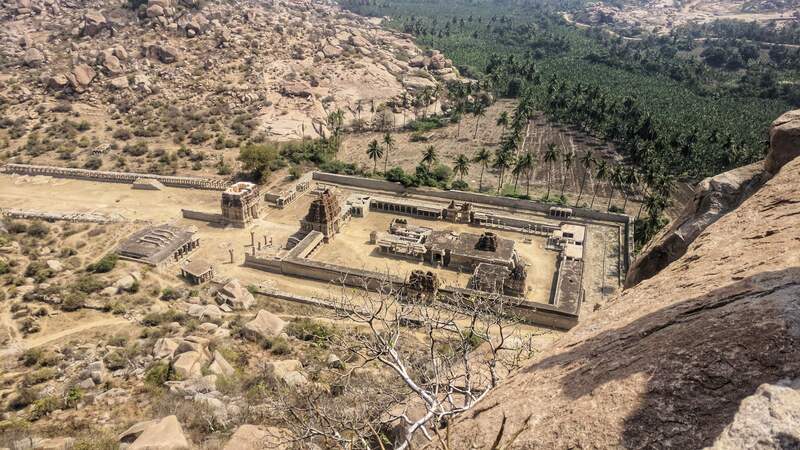 Things used to be very different in Hampi; this was once a wealthy and thriving city, which became the capital of the Vijayanagara Empire in the 14th century until 1565 when the empire was defeated and the city destroyed. 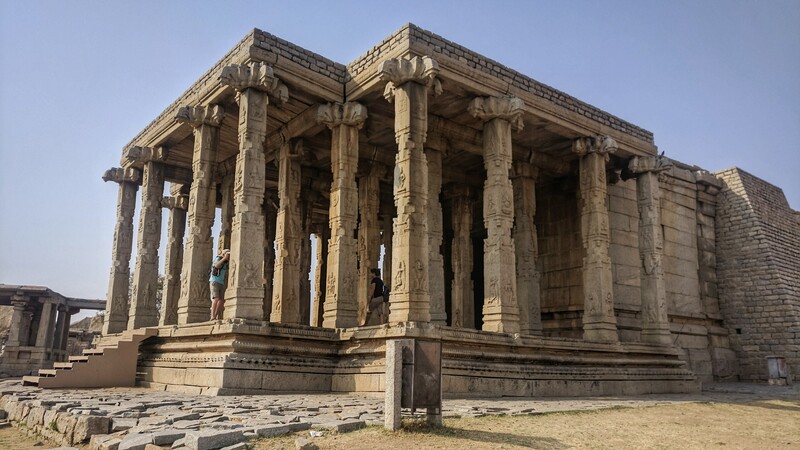 Now a UNESCO World Heritage Site, Hampi is dotted with hundreds of Hindu temples, structures and monuments, all in varying states of ruin, over an area covering 26km². It is surrounded by a stunning and unusual natural landscape of sandstone boulder hills that stretch farther than the eye can see. Like everywhere else in this trip, we came here by train. Well, nearly. Hampi itself doesn’t have a train station, the nearest being a 30 minute drive away in Hosapete. 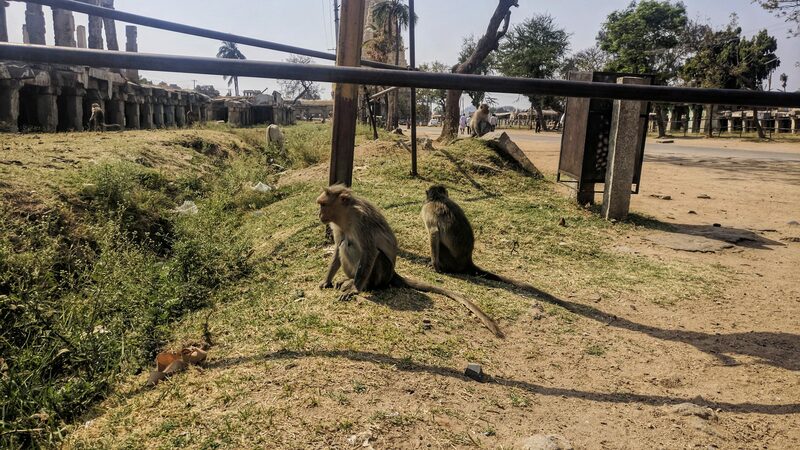 Because the choice of accommodation in Hampi is pretty poor we decided to base ourselves from Hosapete and make a day trip to Hampi by tuk tuk. This also allowed us to be close to the train station for our 06:20 departure time. Getting here was easy; a short eight hour train ride from Goa (yes eight hours is short in India) had us there by midafternoon and 20 minutes later we were checked into our hotel. We stuck this leg of our trip in between two visits to Goa as direct onward trave to Kochi (our next destination) from Hosapete was proving to be awkward and long. The shortest train journey on this route is almost 26 hours, and that’s before you factor in the guaranteed delays that would probably drag that figure up to 29 or more. I love train travel, but no way am I staying on one for that long. 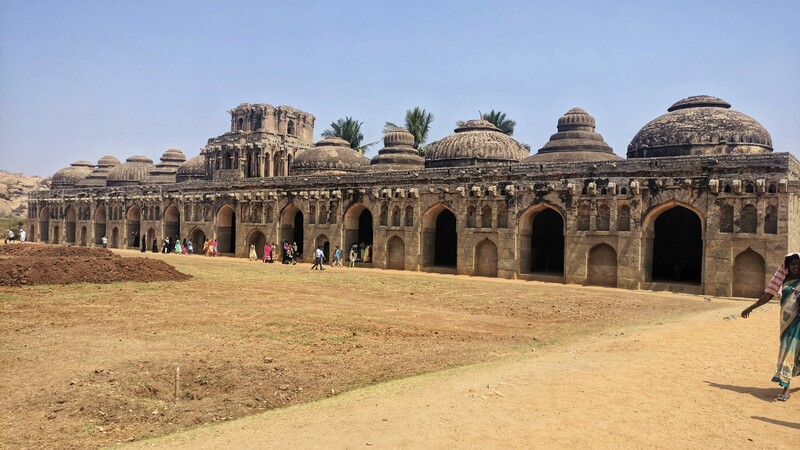 A lot of Hampi’s structures are together in clusters, so for the most part you can easily get around on foot. 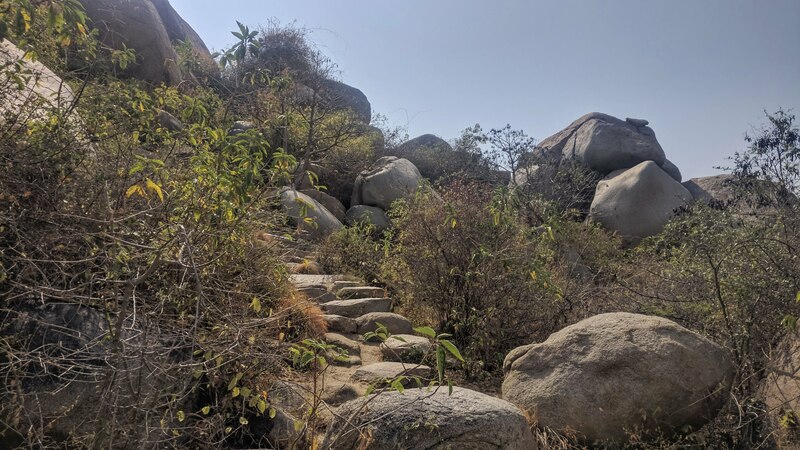 However, as Hampi is quite spread out, naturally so are some of its clusters, so you will probably need another mode of transport to cover the longer distances. It’s pretty easy to find a tuk tuk - there are plenty waiting close to the main attractions or parked in the shade of big trees to avoid the unforgiving heat from the sun, so we made use of their services once or twice. Bicycles are another way to get around and you can rent them in the village, but we decided it might be difficult to cycle in such high temperatures. Entry: free. We only had one full day to see Hampi so we decided to have an early(ish) start to make the most of it. 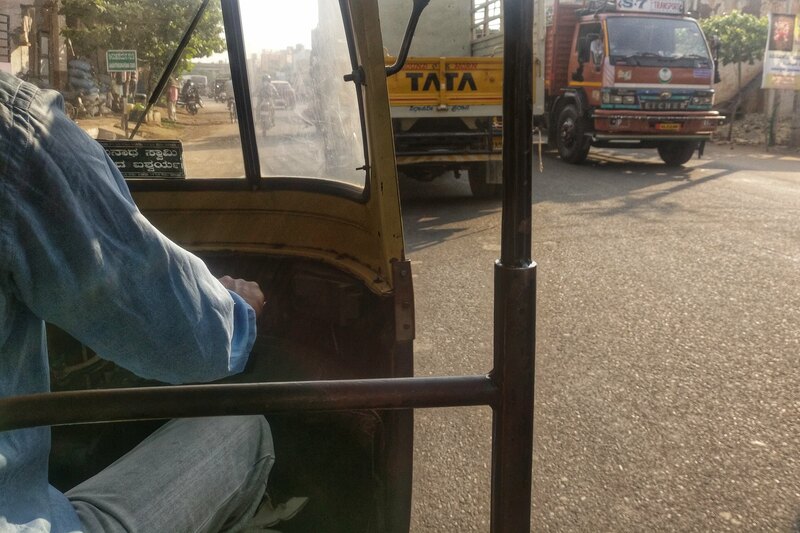 We left our hotel at around 08:30 after filling up on a big breakfast and immediately spotted a tuk tuk waiting to greet his first customer of the day, and got to Hampi a little after 09:00. We didn’t want a tour guide herding us around like sheep to the same few places they show everyone and missing out on the chance to explore the place on our own, but we also wanted to understand what it is we are looking at and how to find our way around. We found a small Hampi guidebook book for sale in our hotel and bought it for around Rs. 150 (less than €2). This really came in handy as we could just pop it open at any time and read about everything on the spot. This let us to go at our own pace and for a fraction of the price of a tour guide. It’s totally free to get in to Hampi and to see most of the ruins, which is pretty great. However, if you want to see some of the main attractions there is a fee of Rs. 500 (€6.28) for foreigners. Virupaksha Temple is only an additional Rs. 2 to go inside but we didn’t even bother as we were a little bit strapped for time. That is an unbelievably fair price when you see that a one day pass for the not too dissimilar Angkor Archeological Park in Cambodia is €32. Angkor is amazing and all but there is no way that it’s five times better, and in some ways I actually preferred Hampi. 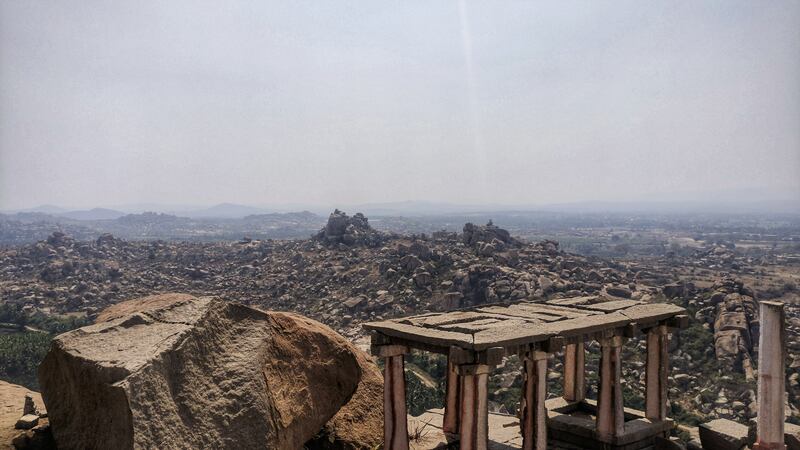 If you ever decide to come put Climb Matanga Hill on your Things I must do in Hampi list. 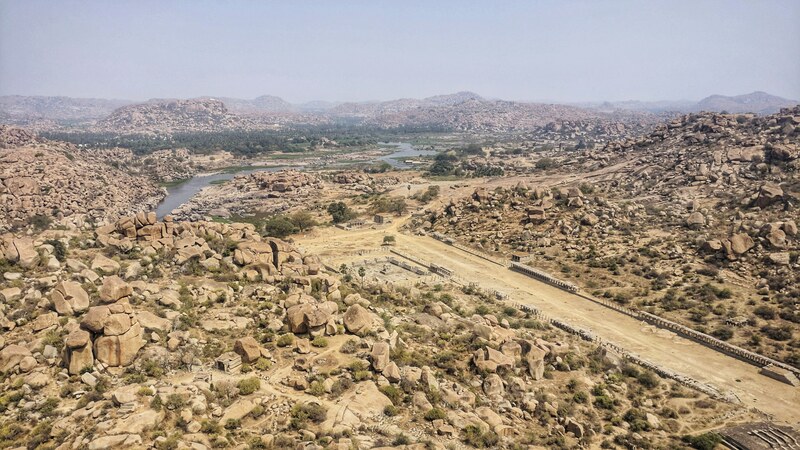 It is the highest point in all of Hampi so you truly get a unique viewpoint of this ancient city, and on a clear day you can see for miles around. It’s not very difficult to climb, but the heat and humidity of the day poses the greatest challenge to you making it to the top. That’s one reason it is probably best to go earlier or later in the day, for sunrise or sunset. The other reason being the stunning views you will be rewarded with at these times. We started the ascent at around 11:00, just as the temperature was moving from very hot (32°C) to very very hot (34°C). The views from the summit of this giant hill of boulders were simply breathtaking. In the distance we could make out Virupaksha Temple, standing at 49 metres high but made to look 49 millimetres tall from up here. Maybe it was just the time of day, but there was nobody else here except for us and Gareth from New Zealand who we met halfway up. No waiting for someone to take their selfies so we could walk past them before waiting for the next person to take their selfies so we could walk past them. Once again, we felt that we didn’t give ourselves enough time here. 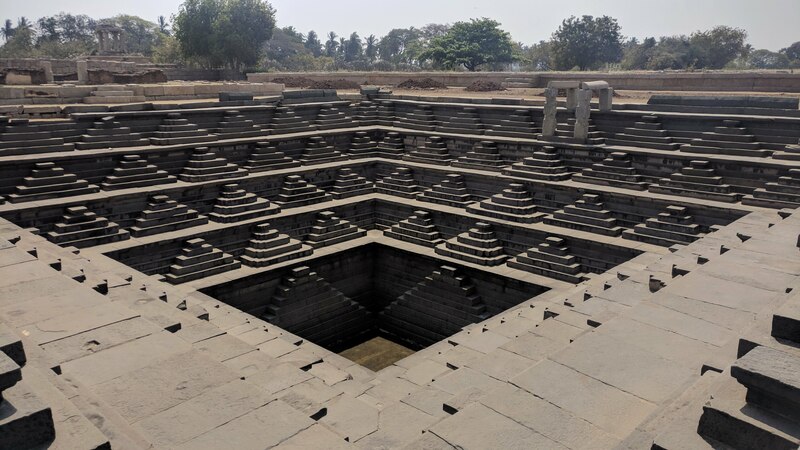 I feel that there is unfinished business between me and Hampi, and I definitely want to return and take my sweet time to explore it all and soak everything in. Nonetheless, what a spectacular place. Go here. Do it. Back to Goa after this, but I’ve already talked about that. So next we will be going to our final state (😞): Kerala. There’s plenty to see and do here, but we decided to slow it right down and limit our last week in India to two places - Kochi and Kovalam.